People often ask me “how can I become more accurate with my shooting” my answer is a boring one and I can always see the person’s disappointment straight away and that’s you’ll never become an accurate shooter without practice. Now this answer is a little simple but I will explain the reason why I give it and that’s that most people who ask this question have never picked up an air rifle or gun and they want to be a sharp shooter from their first shot this is never going to happen. There is a little more too accurate shooting than just practice a good air rifle scope will make accurate shooting a little easier once you have your air rifle scope sighted in. Once you have your air rifle and your scope all setup then it’s time to get your targets set at different distance because if you ever do plan on hunting with your air rifle you will want to be able to shoot at different positions. Targets come in all different shapes and colours from animal outlines to simple circle target and one is not better than the other I just recommend one that you can keep track of your shots. When you first start out it can become a pain paying out for targets they are not all that expensive but anyway to save money is good and I print my own from a brilliant site who allow you to choose a target you like download it and print it from your printer. Shoot with pellets that are not going to break the bank when I say this people say but don’t all pellets shoot different so when I come to shoot with my hunting pellets I won’t be as accurate. To some extent this is true but you will be learning to become accurate and learning how you move your body effects where your pellets end up. So before you go hunting have a couple of shots at a target with your hunting pellets and if you are a little out you will have learnt how to adjust your body to get it spot on and I don’t really subscribe to one pellets is much more accurate than another. I have known people to use the cheapest pellets on the market and never miss a bull. You may find with very cheap pellets that you will get what people like to call flyers this is just the odd 1/100 go way off. People will give you advice how to stand/sit/lay and how to hold the air rifle but I just say get in a position that you feel relaxed and how to air rifle that it feels right and take your shots you will become much more accurate this way over seating in a position that you feel awkward in. Most of all the learning process should be fun don’t beat yourself up if you are not hitting the centre of the target each and every time it will come and it won’t take that long. You have just got yourself a new air rifle scope, you have fitted it and your pellets are going nowhere near the point of aim? Unfortunately it’s not just a case of attaching your scope and you will be upping your accuracy but getting it so you can up your accuracy you will need to zero in scope of your air rifle. People like to overcomplicate the whole process if you ask me and I fell into the trap for many of years when I would be adding a scope to a new air rifle but those days are gone with this simply method. To help with this method you will need a solid surface and an air rifle rest you can use some old socks filled with sand to rest your air rifle on but for greater accuracy I would suggest an air rifle rest and they are not that expensive here is one on Amazon for less than $30. Step 2 – Place your air rifle on the rest if you have a zoom scope fully zoom your scope and focus your eyepiece. Step 4 – Now put the cross hair back into the centre of the target and using the cross hair adjustments move the cross hair until it matched with the hole you just shot. This is where the air rifle rest comes into its own you will need to keep the air rifling as still as possible. Step 5 – Now point the cross hair back to the centre of the target and take your shot it should now be very close to the centre if not repeat the above process until its bang on. That’s the whole process done and you now have a fully zeroed in air rifle scope despite the little long explanation with this method you could have an air rifle scope fully zeroed in within minutes. I would always recommend an air rifle rest this will help keep your air rifle really still and lead to greater accuracy. There really is nothing worse than a scope that is not accurate and I hope this method helps you zero in your air rifle scope for much better shooting and a lot more fun if you need any help drop us a line and I am more than happy to help with anything. You should always remember that your air rifle is not a toy and can cause serious damage and even kill. You should tread your air rifle as a live firearm and use it in a safe responsible manner. This air rifle safety tips is to help the beginner to drill into you the safety aspect of air gunning. Above all what you should remember is always know where you are pointing the air rifle and never point it in an unsafe direction and when you do shoot make sure you know were the pellet will end before you finally pull the trigger. Treat it like its loaded – Always treat the air rifle like it has a pellet in it, never point it in a person direction even when it’s not loaded. Safety on – Always put the safety catch on even when the air rifle is not loaded but don’t rely on this to make the gun safe as although not common things can fail the only safe air rifle is an unloaded air rifle. Don’t put it down – You should never put the air gun down once it’s loaded to put the air rifle down discharge the pellet. Unattended air rifle – You should never leave your air rifle unattended you don’t know who’s going to pick it up. Check – When you first pick up the air rifle always check that the air rifle is unloaded this is something of a habit you should get into. Pellet destination – Before you pull the air rifle trigger think were your pellet is traveling and were it will be hitting or if you miss the target where will the pellet end up. When you think it is all safe then pull the trigger. Loaded air rifle – When you put your air rifle into storage never leave it loaded. Pellets – When you store your air rifle I always recommended that you store your pellets in a different location if someone who shouldn’t be using it finds your air rifle they won’t have any pellets. Out of sight – When you store your air rifle never leave it in sight so people can easily see it also when carrying your air rifle in your car keep it covered. There are some basic tips when you are using your air rifle and when you come to store it always keep in mind your air rifle is not a toy and can kill this should stop you from taking risks as the consequences can be fatal. An air rifle is a great item to own and you can have many hours of enjoyment with it but keep safe and keep others safe. Hunting rabbits is fast becoming a sport that the air rifle is fast becoming the weapon of choice to take the clean shot. Hunting rabbits with air rifle can be a tricky sport but a very fun one as rabbits are fast movers and are alerted very easily. We all have different reasons for hunting rabbits some hunt because rabbits are becoming a pest and others hunt for the pot. Within this post we are going to be covering all the key elements of hunting rabbits. What air rifle to use when hunting rabbits? 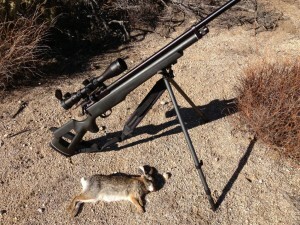 A .177 or .22 is the ideal air rifle for taking out a rabbit you would ideally be looking for a velocity 500+ and hitting the rabbit in the kill zone will lead to a humane kill. It’s also recommended that you use hunting pellets I recommend a dome headed pellet. What is the kill zone on a rabbit? When shooting a rabbit you should NEVER shoot it in its body this will just wound it and lead to unnecessary pain, you will need a head shot for a humane clean kill when looking at the rabbits head aim for just behind the eyes and just below the ears. This is the rabbit’s weakest part of the skull and will ensure a clean kill. Was it a clean shot? Once you have taken your shot wait for around a minute and retrieve the rabbit hold it in your hands for 5 seconds if you feel any movement you will need to take a shot to the head or break the rabbits neck to cause an instant death this shouldn’t happen very often if you hit the shot in the correct spot. An air rifle scope will make the shot much easier and much more enjoyable, before you go hunting with the scope you will need to zero in your air rifle scope to make sure its accurate also I recommend that you zero in your air rifle with the pellet you will be using to hunt. An inaccurate shot can lead to wasted hunting day and worse a wounded rabbit. So now you know how to take the clean shot and were to shoot as rabbits a spooked very easily so you will need to keep still for a long time so if the weather is bad you will need to wear clothing that will keep you warm. Wait in position until the rabbit comes out load the air rifle with a pellet keep the rabbit in your sights or scope if you are using one for a minute. This will give you time to get your breathing under control (the excitement can make you breath heavy) take the aim in the kill Zone and take your shot this should result in a clean kill. Make sure you take the shot 2 yards from the hole as the rabbits nerves will make the rabbit jump and could end up in the hole wasting the rabbit. Don’t just turn up on someone’s land taking shots ask permission. Always go for the kill shot and if do happen to wound the rabbit ease it’s suffering as soon as possible. Make sure you don’t shoot people so follow some basic air rifle shooting safety tips.